Today, we make a sparkly birthday card with Dazzling diamonds and Crystal Effect! 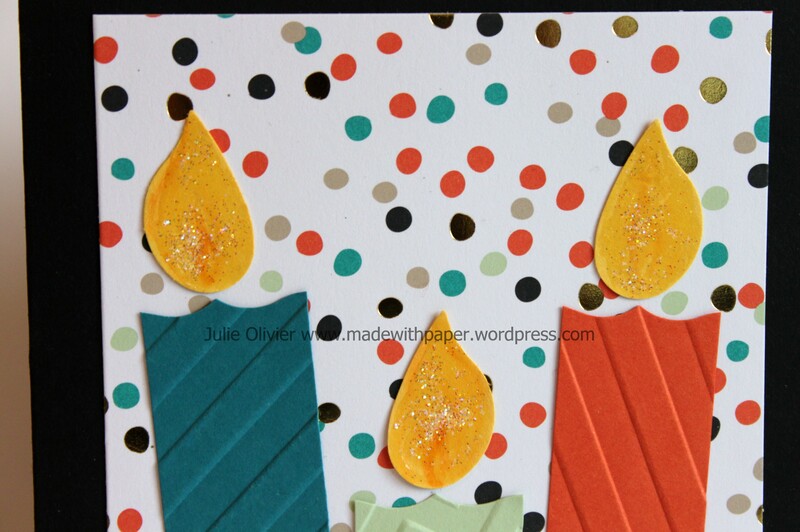 Do you like the joyful dots in the background? 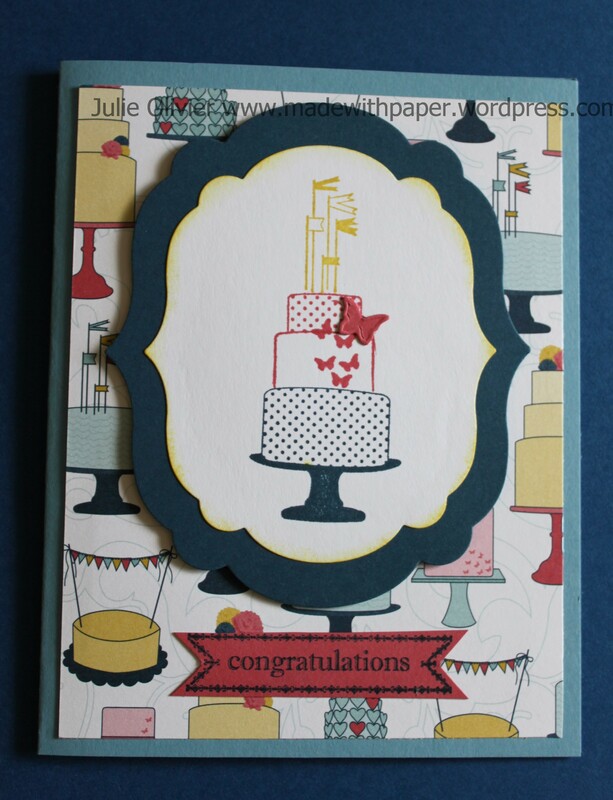 The paper comes from the FREE Sale-a-bration card kit “Good as Gold”. Get it now until you can! The Sale-a-bration is ending in less than 3 weeks! The flame of each candle was cut with the Bird Builder punch (with the bird wing) and colored with a little bit of Pumpkin Pie ink using the Blender pen. The flame of each candle was covered with Crystal Effect and before it dries, I sprinkled some dazzling diamonds to make them really shiny! The dazzling diamonds glitters get caught in the crystal effect as it dries. 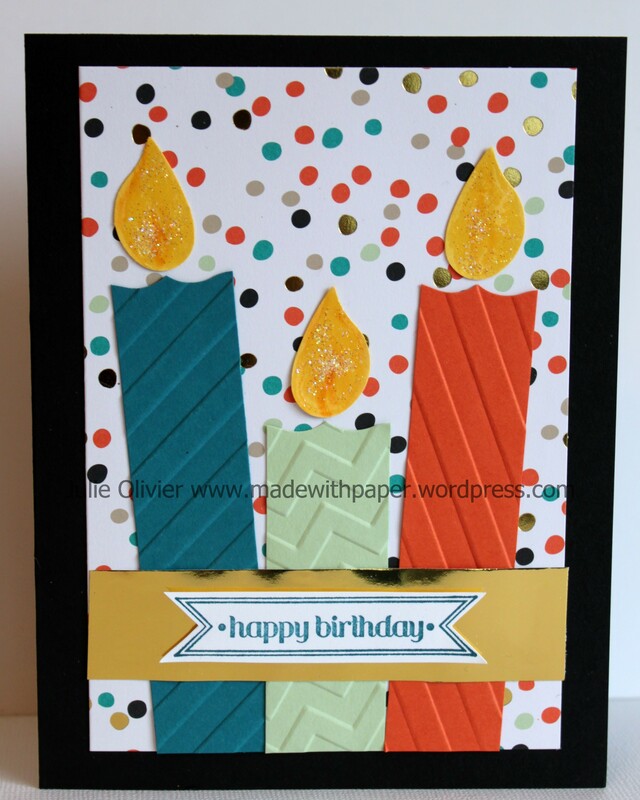 The candles were embossed with the Stripes and Chevron embossing folders. I used the Curly Label punch to cut the shape at the top of the candle. The trick is to insert only one end of your strip from the top of the punch. 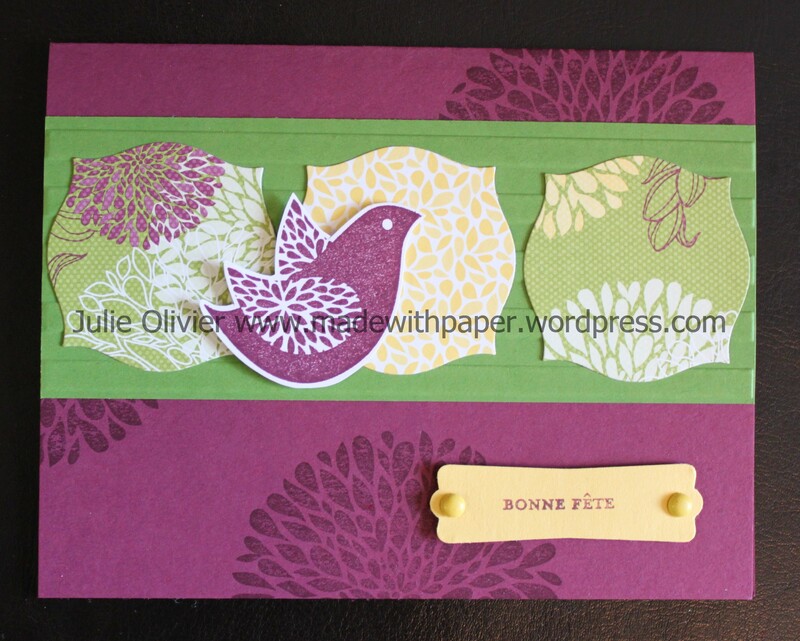 Tools: Bird Builder punch, Curly Label punch, Big Shot, Stripes and Chevron embossing folders, Blender pen. 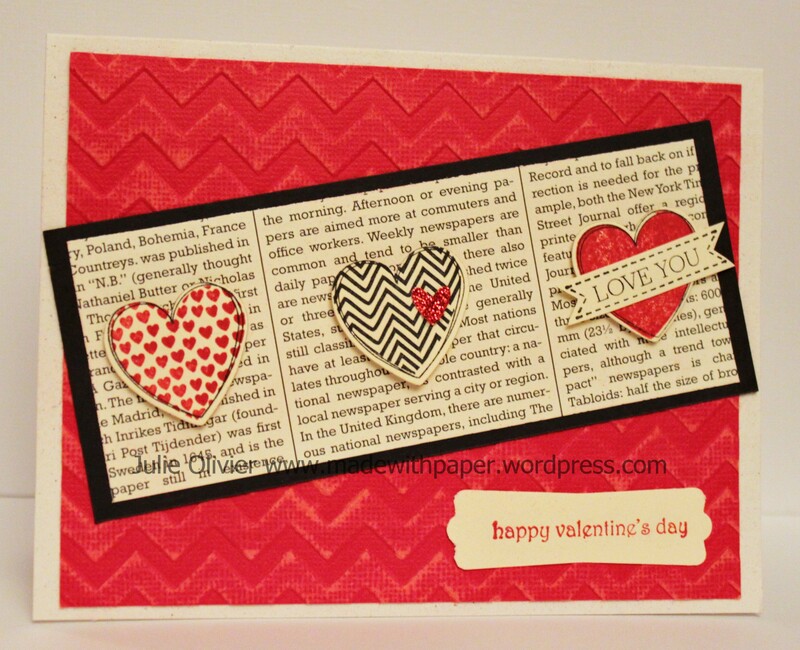 I used that set for this Valentine’s Day card that we’ll be making at my Monthly Card Class on January 25th, at 7:00 pm. Register early if you want to come, as space is limited! Just email me at julie_olivier@hotmail.com to reserve your spot. 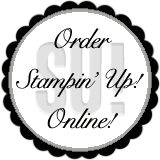 We’ll be using the new “sandable” Real Red Core-dination card stock and this new stamp set! Here’s the stamp set and the Framelits dies. 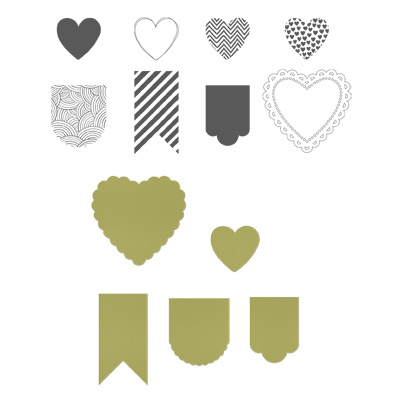 Even though it’s more of a Valentine’s Day set, you can use the fanions and flags for many other occasions. Therefore, it’s much more versatile! I always love to use my “stuff” for many different ways! You get more value for your money!!! Love the new pinwheel Sizzlits S die! 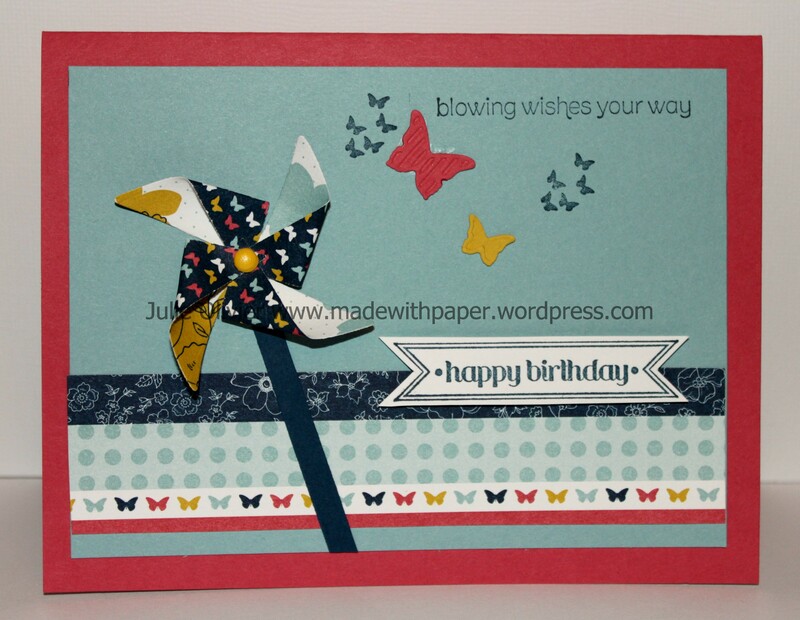 I used Designer Series paper from the Patio Party collection for the pinwheel and the stripe. The colors I used for this card are mostly from the new 2012-2014 In Color: Midnight Muse, Primrose Petals and Summer Starfruit. I also used Baja Breeze for the background. 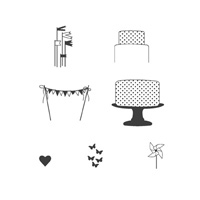 The little butterflies are from the “Make a cake” stamp set. 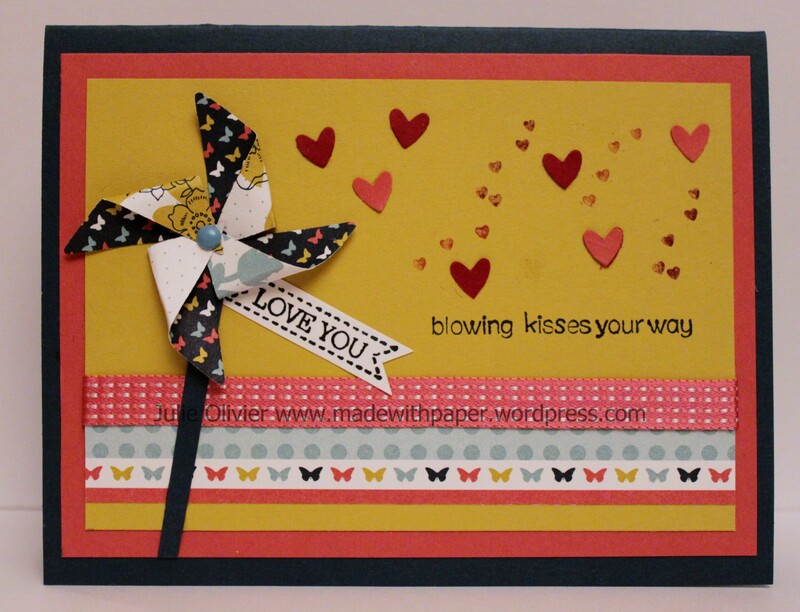 Tools: Big Shot and Pinwheel Sizzlits S die *NEW*, Beautiful Wings Embosslits. This is the new “Wishes Your Way” stamp set. It’s only $16.95 for the clear and $21.95 for the wood-mounted. It’s a very versatile set and I’m sure I will use it very often! Get yours now! Now, look at the second card I made and try to spot the diffences!!! 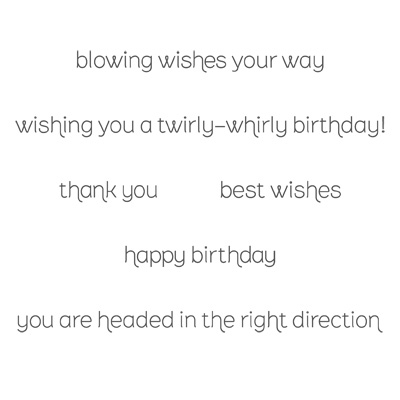 Can you see what I did to transform the greeting? I changed “wishes” to “kisses”!!! Are you wondering how I did that? I simply used the marker to color the stamp and I omitted to color the “w” and “h”. I stamped it and then I added the “k” and “s” by and using the marker fine point! Voilà! Do you like it??? 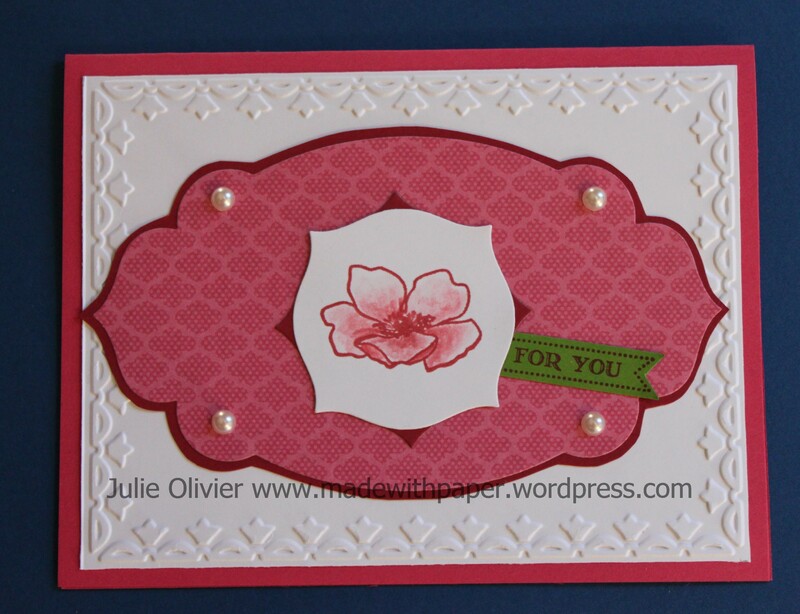 The small hearts are from a stamp in a new set “Hearts a flutter”. There’s a heart made of small hearts, but I just colored a few little hearts on it with the marker to achieve the look I wanted. 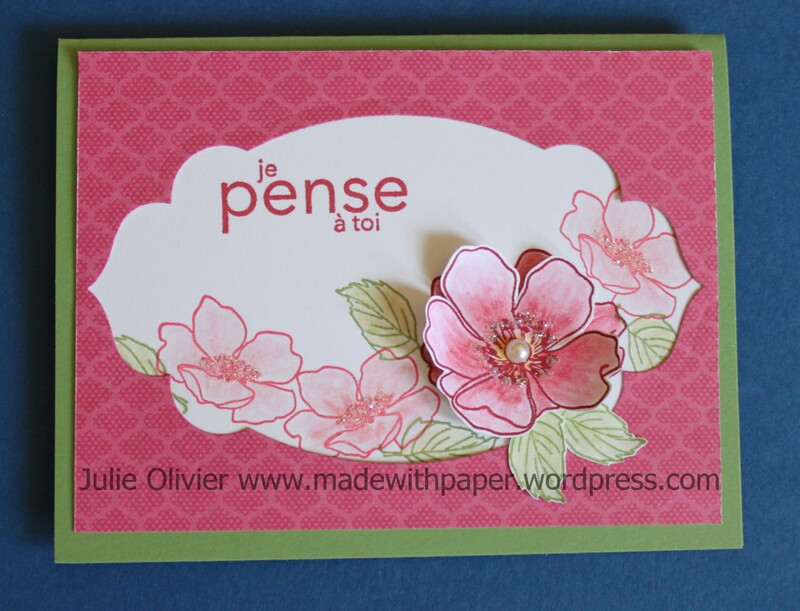 I made another card with the Papillon Potpourri stamp set and Vellum. This card uses all new porducts! 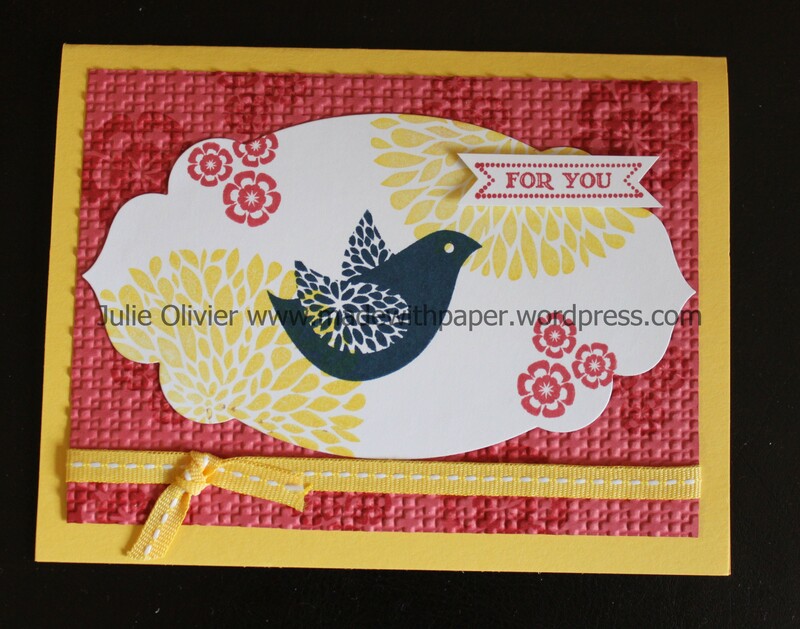 New In-Color: Primrose Petal, two new stamp sets and new ribbon! 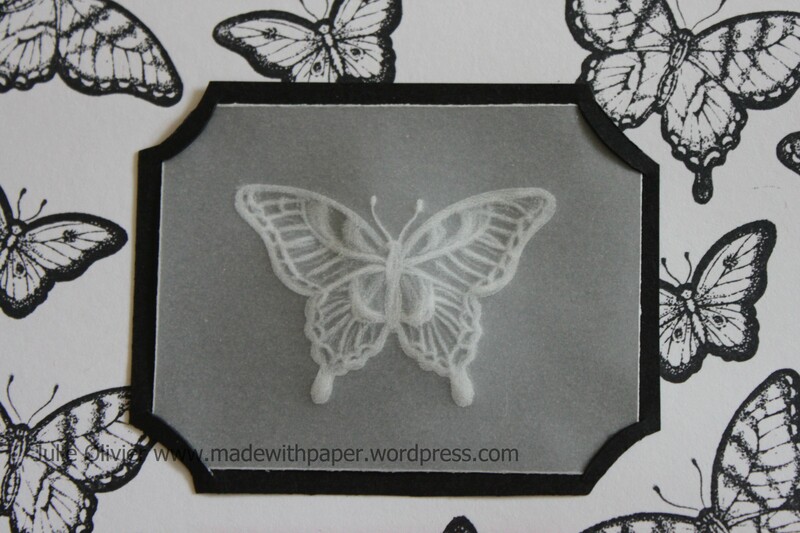 The butterfly was stamped in White craft ink on Vellum card stock and them outlined with a stylus from the back. 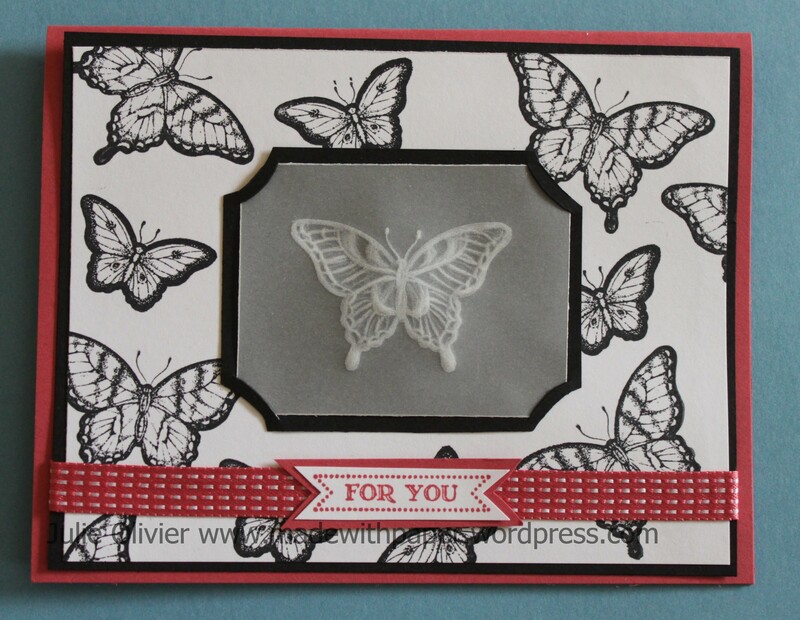 I stamped the same butterfly in Basic Black on Whisper White card stock for the background. 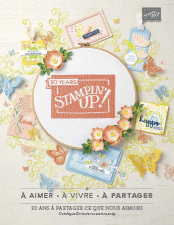 The greeting is from the Itty Bitty Banners stamp set. Ink: StazOn Black ink, Whisper White, Primrose Petals. Accessories: 3/8″ Stitched Satin Ribbon in Primrose Petals. More of the Apothecary Framelits! It seems that the possibilities for the new Apothecary Accents Framelits are endless!!! So here’s another card I made using 2 of these framelits. Do you see how I used 2 of the same shape in the center but one is rotated so you only see the points sticking out? The flower is from the set “Fabulous Florets”. The design paper is from my favourite, Floral District Designer Series Paper. CS and paper: Primrose Petals, Whisper WHite, Rasberry Ripple, Gumball Green, Floral District DSP. As I was writing this post, the power went down for a little while. So, since I couldn’t use the computer anymore, I went back to my desk and made a second card, using the left over paper… I’m sure you will understand which one I’m talking about after seeing the picture! 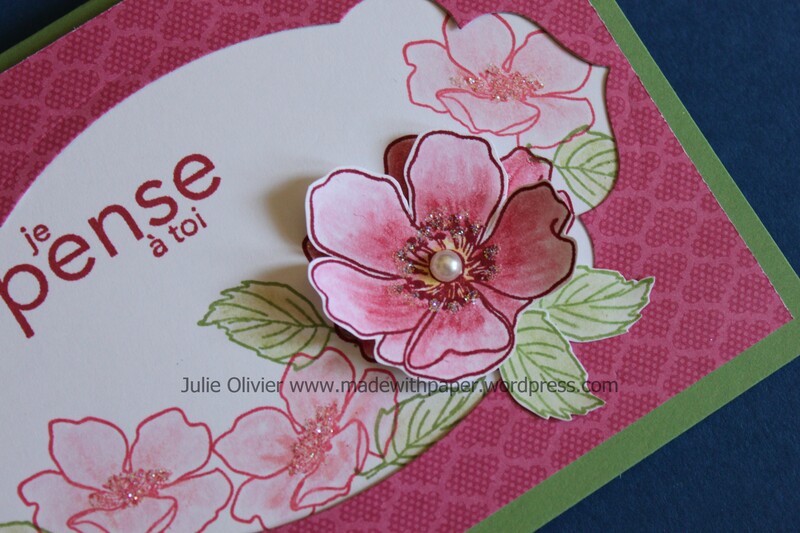 I also used Fabulous Florets stamp set for the flowers. A little “bling” with Dazzling diamonds and a pearl is always a nice finishing touch!!! CS and paper: Wild Wasabi, Whisper White, Floral District DSP. Accessories: Basic Pearls, Dazzling Diamonds and 2-Way Glue pen.